Saturday was my one year blogiversary! On November 28, 2008 I made my blogging debut with my Dad’s chili recipe. To celebrate reaching the one year mark I decided to make the Flourless Chocolate Cake from The Gourmet Cookbook. I thought it would be a nice departure from Thanksgiving desserts and I can’t get over how easy it is to make this cake. It’s a perfect option for an impressive dinner party dessert when you don’t want to spend all day in the kitchen. I am not the biggest chocolate dessert fan (I know, I’m crazy) but Brandon gave this cake two thumbs up and I consider him a chocolate dessert aficionado. He is known for always ordering the most chocolaty and rich dessert on the menu at restaurants! 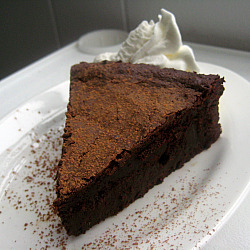 The texture is almost brownie-like (fudgy) but the taste is similar to a very dark chocolate cake. Brandon requested his with a scoop of ice cream but it’s also nice served with fresh whipped cream, a dusting of powdered sugar or cocoa powder and fresh berries. 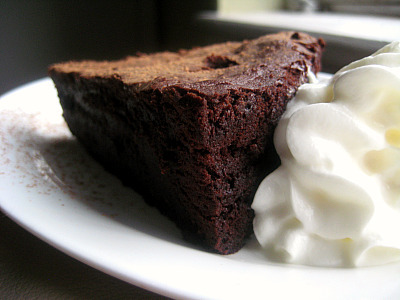 If you’re having a chocolate craving or looking for an easy dessert to impress guests give this Flourless Chocolate Cake a try! Preheat oven to 350 degrees. Generously grease a 9 or 10 inch springform pan and line the bottom with wax or parchment paper (cut into a circle to fit bottom of pan). Make sure to grease the liner as well. In a double broiler or in a large bowl over a pan of simmering water, add chocolate and butter. Stir constantly until melted. Remove bowl from heat and whisk in sugar. Add eggs, one at a time, mixing well after each addition. Last, sift cocoa powder into mixture and whisk until just combined. Pour batter into prepared springform pan and bake for 35-40 minutes. A toothpick inserted in the center should come out with moist crumbs and top should have a thin crust. Cool cake in pan on a rack for 10 minutes and then remove sides of pan. Invert cake on a plate and then back onto the rack to fully cool before serving. 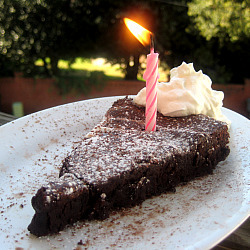 CONGRATS ON YOUR BLOG’S 1st BIRTHDAY! Congrats! I can’t believe it’s been a year already. This cake looks fantastic! 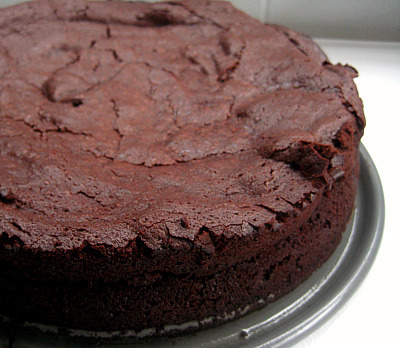 Your flourless cake looks perfect! Happy Blogiversary! Congrats on your blog anniversary! That first year flies by, doesn’t it? What a gorgeous chocolate cake. It looks so delicious and a spoonful of whipped cream is the perfect garnish. Cute blog title. Love it.